Jade Rossington and Peter Keating are at the forefront of their fields. Jade is the farm manager at Willow Park Stud and Peter is the breeding shed manager at Newgate Farm. Together they represent several decades of knowledge and experience, and each has enthusiasm and pride in what they achieve each day. A measure of the regard in which Jade is held is that she was nominated by one of her employees, Lisa Richards. “The definition of a good leader is that they must communicate well,” Lisa wrote in support of her boss. 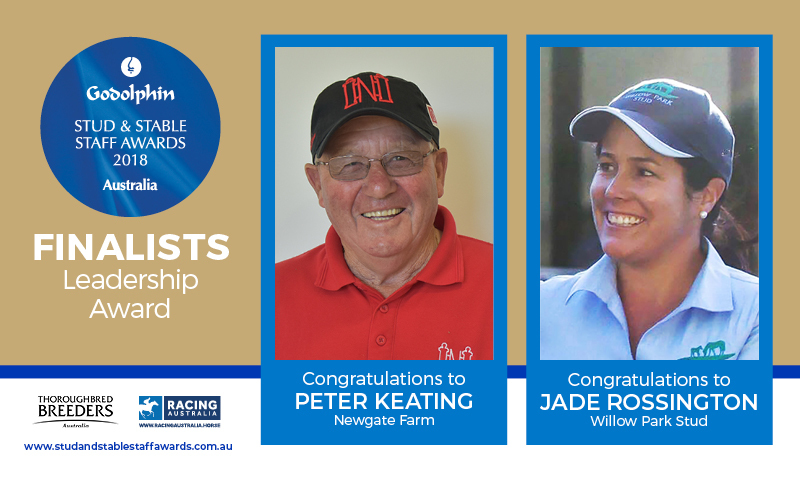 “One of the greatest honours for me in this year’s awards is that I have been named alongside Peter Keating, who has been such an inspiration to so many in the breeding world,” said Jade. Peter has spent 60 years in the racing and breeding industry, and has seen and done just about everything. But being a finalist in the GSSSA has a novel twist. “I used to be a lecturer to students on the Godolphin Flying Start programme,” he said. “During that time, one of those who I lectured to was Henry Field, who is now the proprietor of Newgate Farm. So it’s a great source of pride to me that I’m now working for him.